4. Find internal wellness champions; develop and embrace an organizational vision for wellbeing. Now that the stars are beginning to align, management is invested in the program, the partners, tools, and resources needed have been established, you can now begin to look internally at where to go next. Most wellness vendors, and consultants like me, recommend setting up a committee to champion the program. Smaller organizations might have one or two people, while a larger organization may have a larger group. To obtain a well-rounded perspective, the committee should represent the office as a whole, not just certain pieces. Different divisions, remote employees, various departments, or other organizational demographics should all be represented. A successful program needs a group of people who are in charge of equal parts of the organization and who are actively engaged in effective change. These champions are the ones the employees come to rely on for information; they are the wellness cheerleaders of your organizations, walking the talk! Members can be appointed or volunteer, but I highly recommend setting guidelines and expectations for committee members up front. Create a vision within the committee or team and gain insight on what the employees want in a program. What is the goal and purpose of having a health and wellness program? This might seem basic, but it is a necessary question. What do you want to accomplish? Is your organization looking to drive down the cost of claims? Although cost containment may be reason to look at wellness, it should not be your only goal. Successful groups implement programs to improve the lives of employees and their families. Your vision does not have to be formal, but the purpose of the program and why it is being put in place should be communicated. As the employer, sit down and ask the employees what they want in a wellness program. You would be surprised at the number of employers I have worked with that have not asked their employees anything. Engagement with employees is vital to the success of the program; build your vision and plan with their help. 5. Set health goals and tailor program elements and incentives to meet them. With the aggregate data in hand, it is time to define a program outline and set goals. It is easy to get ahead of yourself when beginning this program by creating unrealistic goals that are too demanding of employees. You will not have 100 percent participation in your first year. Strategize and establish measurable goals with your committee, wellness vendor, and benefits consultant. Setting realistic expectations is crucial for program success. Find the balance between offering enough activities to keep employees engaged, but not overwhelming them with so many activities that it becomes taxing. Do not be afraid to want to see your program succeed! Look ahead and create a six- to 12-month program. I prefer to create a 10-month program with some type of monthly healthy activity. Select programs and topics that relate directly back to the aggregate data you collected. For example, if you have data that says less than five percent of your population uses tobacco, then you do not need to implement a 12-week tobacco cessation program. Instead, assist that five percent by providing some free education and resources for support, then focus on where your organization might need more attention. Find programs that support employees on their overall health journey. Ask questions to identify programs that will encourage and influence behavior changes. For most organizations, it is common to offer programming geared to employees that are pre-hypertensive or hypertensive, overweight, obese, have high cholesterol, or employees experiencing high stress and anxiety. Rely on your benefits consultant or wellness vendor to make the best practice recommendations for creating behavior changes related to these risk areas. You may be able to use your existing Employee Assistance Program (EAP) and market it more heavily. In more extreme cases, you may need to utilize health coaches available with your wellness vendor or through your disease management program. Think of setting goals in terms of the percentage of participation would you like to see in the first, second, third, and future years. For example, you may want to see utilization of medical preventive care benefits increase from 57 to 75 percent, or see employee engagement increase from one activity to the next. Setting two to five measurable goals early on, then evaluating those goals monthly, provides valuable insight into the program’s success. Make goals and programming obtainable; create an atmosphere of success for your employees. Do not forget to use incentives. What will get your population “moving?” The discussion of whether intrinsic or extrinsic incentives are more effective is a lengthy one and of much debate these days. From internal case studies, it is my expert opinion that employers willing to link their wellness program incentives to their benefit plan design in the form of reduced medical premiums, or making contributions to an employee’s health savings account or flexible spending account, see the greatest level of participation and overall behavior change in their employees. Of course, this does not occur overnight, but rather over time in coordination with your benefits consultant. This becomes a way of creating a cost-effective and consumer-driven healthcare plan that uses incentives to encourage your employees to make high-value decisions. A testimonial from one of our client’s employees says it all when it comes to intrinsic vs. extrinsic incentives. "In short, I came for the savings, I stayed for my health. The first year I only participated for cost savings thinking, ‘Who would really like this?’ The following year I signed up for a health coach. Now I'm living healthier, eating better, exercising more, and more importantly, feeling better. Now I think, ‘Who wouldn't really like this’?" 6. Kick it off, communicate and evaluate. Roll out your program! Hold a kick-off party for the employees in the office, and conduct a webinar for the employees who work off-site. 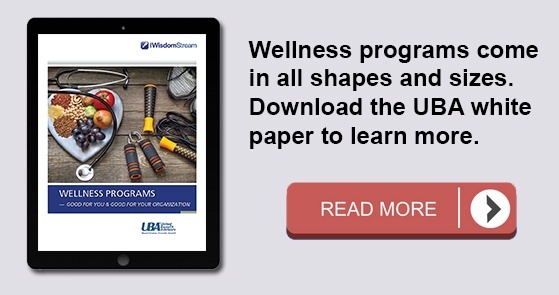 Provide employees with an overview of the program so they understand why your organization has created a wellness program, what employees should expect from their program, and the vision of the program. Make sure to communicate about the program weekly, and use all forms of communication. Ask your employees what frequency of emails they prefer. Many of our clients, including my own company, like to have two emails a week to remind them of what is going on. Use social media, provide videos, webinars, etc. The more buzz that can be created around the program the better. Keep employees engaged and excited when it comes to your program, but do not overwhelm them with communication. Send emails about the challenges keeping employees engaged and involved, on who is winning, and success of activities. Create an environment of success using these communication methods. Last, evaluate the program realistically. What went well? What needs improvement moving forward? Get real-time reporting from the vendor for participation. Review the program throughout the year and adjust as needed – no program is ever static. If you are not making changes each year, you are not being realistic. Improvements can always be made. Survey employees about things they learned, what they liked, and what they would do differently. You can use your vendor or benefits consultant to assist here. Make sure that the feedback from the employee surveys is taken into consideration when moving forward with the program. The more employees engage in the wellness program in its entirety, the more success you will have moving forward.